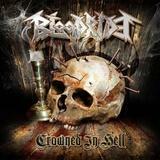 After 10 years, a slew of demos and a very promising single release last year in Supreme Predator, Finnish thrashers Bloodride unleashed a month ago in the form of their debut full-length, Crowned In Hell. Despite being lodged firmly in the 80s tradition of intestine-ripping thrash, the band dips into several varieties and thus avoids carbon copying anything. The instrumental assaults take notes seemingly equally from Kreator and the German greats while also keeping the Bay Area-stylings loose in the holster. Singer Jyrki Leskinen’s hoarse grunt on the other hand has a decided ting of Max Cavalera in it. The song material provides a wide range of brutality. March Of The Dead, Straight From Hell and Promised bring the somewhat fast maelstroms that act as a nice mediator for the different extremes (meaning that the actually fast material is really bleedin’ rapid). Cain and God brood on with the mid-tempo, bringing a darker, less immediate viciousness to the proceedings. Guitarists Niko and Teemu keep the guitar solos interesting by steering clear enough of the Kerry King-style buzzers most of the time while still shredding like madmen. Topping the record as my favourites are the most frantic riff monsters, Slave Of Evil and the last song, Thrown Into Darkness (Unholy War), which should have police patrols around the nation searching their damnedest for the band’s hideout to hand out a year’s quota of speeding tickets at once. Wrap this all together with an iron-clad production job (extra points for the devastatingly great drum sounds) and you’ve got yourself a brilliant soundtrack for a night of beer-binging and hell-hounding. If you’re searching for innovation, spaced-out progressive versatility or the like, Crowned In Hell will probably be too straight-forward for you but it serves the thrash in spades. Perversely enough, maybe the one major thing I was left wanting from this record was something more…ambitious. With players as experienced as these guys are, I think they would have the chops to build a 10+-minute thrash mammoth or something like that. It’s probably not at all what Blooride is all about, but just a thought. Now if you'll excuse me, I’ve got more walls to renovate to the rhythm of Thrown Into Darkness.